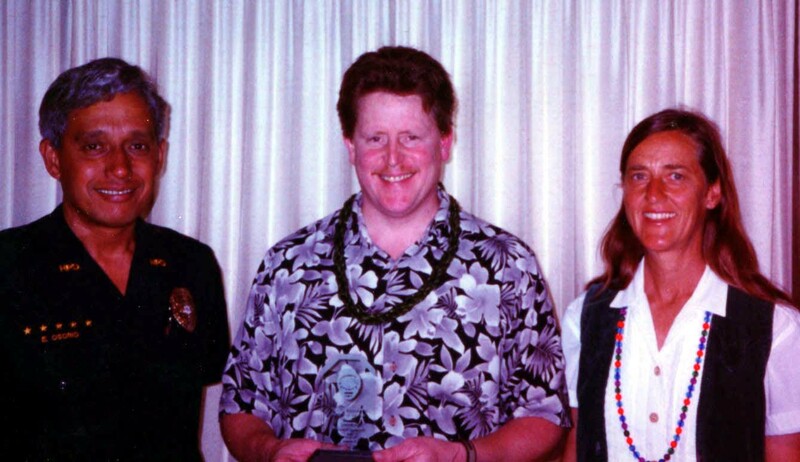 OFFICER OF YEAR AWARD — Puna Patrol Officer Robert Hatton, center, is shown here receiving the Puna Traffic Safety Council’s Traffic Enforcement Officer of 1999 award. Presenting the award to Hatton is Marilyn Haymore, representing the safety council, and Captain Elroy Osorio Jr., Puna District police commander. Puna Patrol Officer Robert Hatton has been named Traffic Enforcement Officer of 1999. Hatton received the award from the Puna Traffic Safety Council for showing a strong commitment to enforcing drunk driving laws. As a supervisor in the use of the Intoxilyzer, Hatton is responsible for the monthly maintenance and record keeping of the Puna District’s Intoxilyzer machines. He is also a field training officer for new recruits.